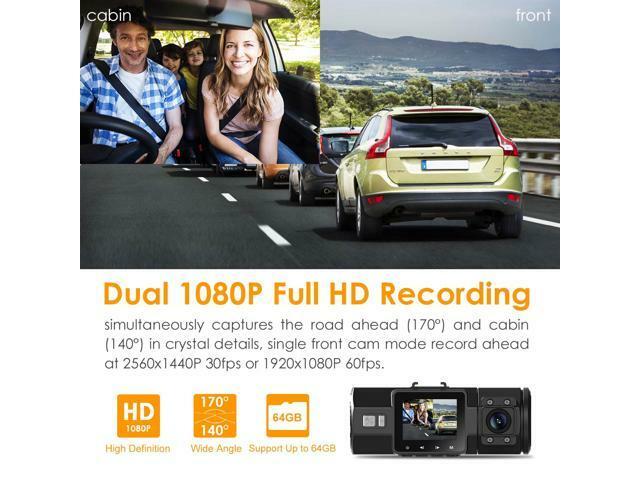 Front and rear dual dash cam shots dual 1920x1080P 30fps. Front only mode records at 2560x1440P/30fps, 2304x1296P/30fps, 1920x1080P/60fps, 1920x1080P/30fps. 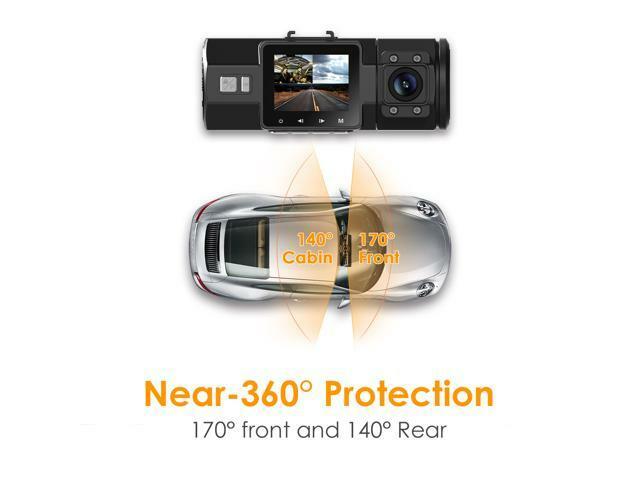 With a 170° front facing and 140° rear facing camera(80° rotatable) in one body, N2 pro captures road front and inside the cabin simultaneously, while the picture in picture screen display both front and rear camera footage at the same time, provides a full protection on the go! 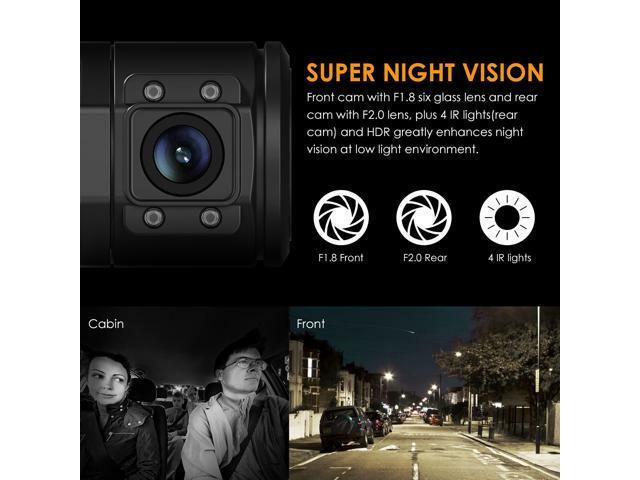 F1.8 6-glass lens front facing cam and unique HDR video system automatically balance the light and dark areas of the video, while F2.0 6-glass lens rear facing cam plus 4 IR LED lights greatly enhances night vision in car at low light environment, making your driving more safer at night. The infrared lights can be set to ON, AUTO ON/OFF, OFF. If you set it to AUTO ON/OFF, When low-light conditions are detected, the infrared LEDs will automatically turn on to support rear image recording, offering you and passengers a higher level of in-car safety. *Footage recorded with infrared LED will be in a purple tint at daytime, and grayscale at night. Built in micphone and speaker to capture high quality audio clear without distortion. Don't want to record voice? Just one press to turn the micphone off. Support auto LCD off timer which enables the lcd off automatically after the recording begins so you won't be disturbed by another glowing rectangle on your windshield, you can also turn this function off if you prefer the LCD stays on. Auto switch to Parking mode when you parked your car. 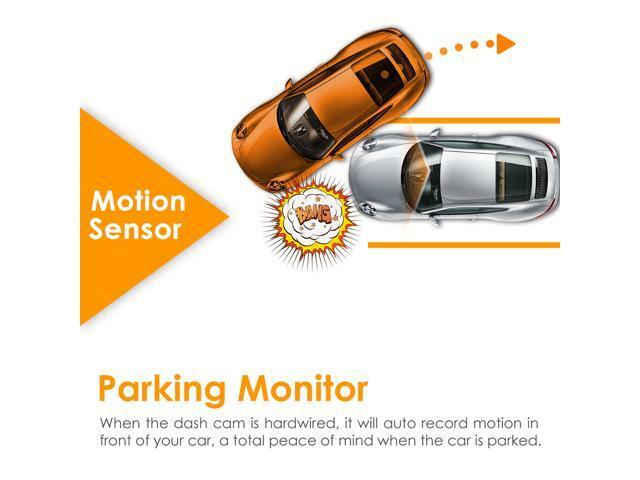 Triggered by the motion detection, the dash cam will auto record once it detects motion in front of your car on parking mode. The camera needs a constant power supply either from an external battery pack or hardwire. 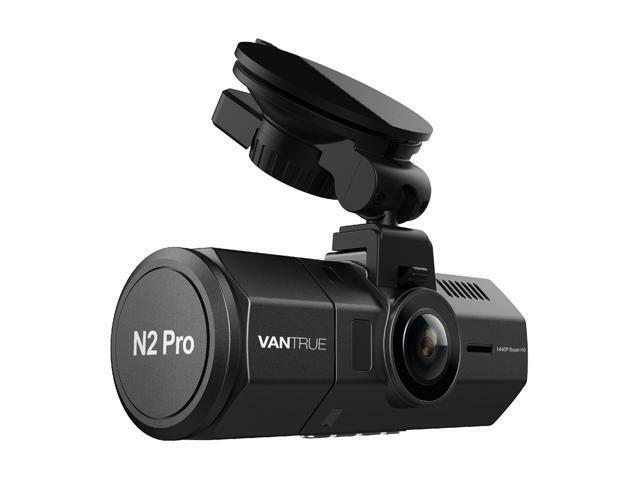 Equipped with PC and ABS housing, the N2 pro dual dash cam can resist more heat damage, working temp is 32 to 158 Deg. F.. Camera will auto shut down when it is over heat, protects itself & car. Auto Starts up and records automatically when the ignition sparks up, loop recording saves the latest the videos and overwrites the oldest videos when card reaches capacity. Supports up to 256GB card max, please format it to FAT32 before use. Time lapse function automatically takes photos at specified intervals and edit them together to a video clip so they can play much faster than real time. 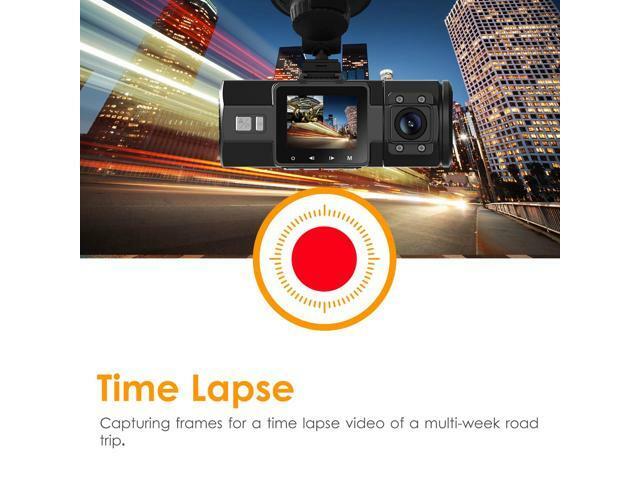 With this function on, you can record movements, changes, or events that take place over a long period of time, or just captures frames for a time lapse video of a multi-week road trip, greatly saved space on your memory card. Optional GPS for you to track the driving route, location and speed. To use gps function, please buy an extra N2 PRO gps mount. 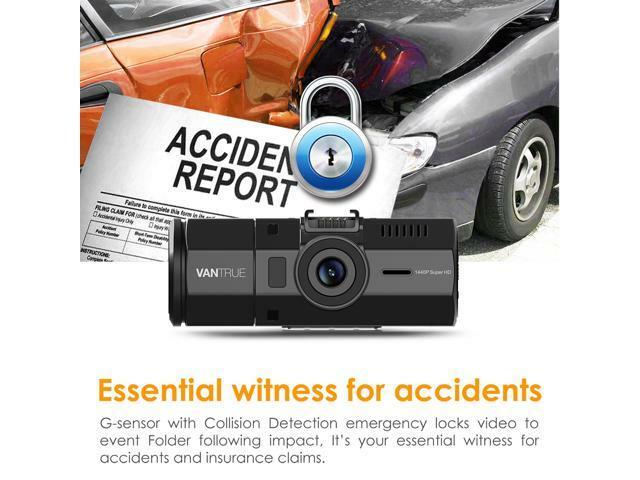 This is especially useful if you need to use your video footage as evidence at times. Ensure that the date and the time are accurate when you install your camera. Front lens: 170° full 6 layer glass lens with F/1.8 wide aperture. Rear lens: 140° F/2.0 wide aperture lens. 1, Please note: No HDMI Output. 2, Before using, please format sd card on your camera. Please insert the card into the camera, (if it says 'please insert TF card' here, please press the recording button(OK button) and press M button to access into the menu, go 'system setup' and choose 'format'. Then the card will working well on the camera. 3, Please press Power button to toggle the night vision mode ON, AUTO ON/OFF, OFF. When the IR lights have been turned on, the IR light icon at the upper right corner of the screen will be a lightening icon; When the IR lights have been switched to auto on, there will be a letter “A” besides the lightening icon; When the IR lights off, there will be a circle around the lightenting icon with a black line across it. You can check the night mode status on the screen overview part on page 3 of the user manual. 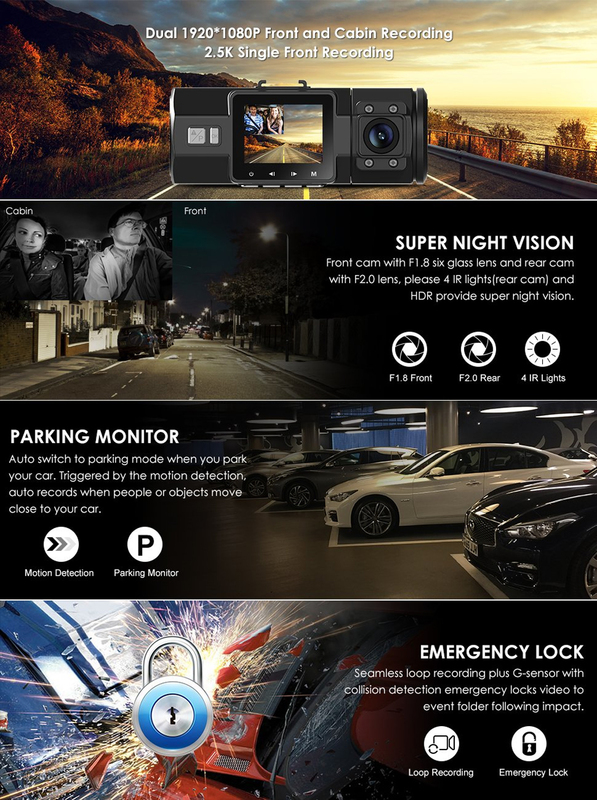 4, The built in 250mAh battery is just to keep setting, please always keep the dash cam plugged in, or it will keep telling you to connect the power. Lens Front: 170 degree wide viewing angle and full 6 layer glass lens with wide aperture of F/2.0. Rear: 140 degree wide viewing angle and full 6 layer glass lens with wide aperture of F/2.0. This item is covered by VANTRUE Return Policy.